Perth is blessed with a wide range of accommodation choices that cater to all budgets, preferences and styles. The variety of stays includes hotels, hostels, bed and breakfasts, serviced apartments and more…the list of Perth accommodation options goes on! A perfect spot to combine travelling and relaxation, The Richardson Hotel & Spa will exceed your expectations. It is not only about premium-class service, but also fantastic facilities, including spacious modern rooms, luxurious Spa treatments, well-equipped gym and indoor heated pool with a garden. If the reasons above are not enough to convince you, just check out the photos of the rooms and amentities and see it for yourself. Located in the heart of Perth, Duxton Hotel is one of the top picks of Perth accommodation. Great attention to details of this 5-start hotel make your stay pleasant, while you enjoy the facilities that include a fitness centre with a sauna and steam room, and an outdoor swimming pool with a hot tub. The on-site restaurant offers modern international cuisine, here you can also find a bar and taste premium Western Australia’s wines. Swan River is just a 5-minute walk away, where you can enjoy the charming views at night and embrace the beauty of the city lights twinkling over the river. Sage Perth is located in the West Perth district, only a 5-minute walk away from Kings Park, which indicates its closeness to all the major landmarks. Various dining and shopping options are at your door step. To keep the guests active and healthy, Sage Perth offers free bicycles and a fitness centre. Beautiful stylish rooms are well-furnished and have a funky modern feel. You can choose to eat a meal in your room or at the on-site restaurant. Wake up to amazing city views while sipping a delicous cup of coffee! To read about other luxury accommodation options in Perth, check out this article – Boutique & Luxury hotels in Perth. Peppers Kings Square Hotel is located in the Central Business District and is only a 5-minute walk away from Perth Arena. All the sights and the main shopping spots can be easily accessed from the hotel’s location. A valet parking service, free WiFi available in both the lobby and guest rooms, on-site restaurant and many more amentities will make your stay comfortable and relaxing. 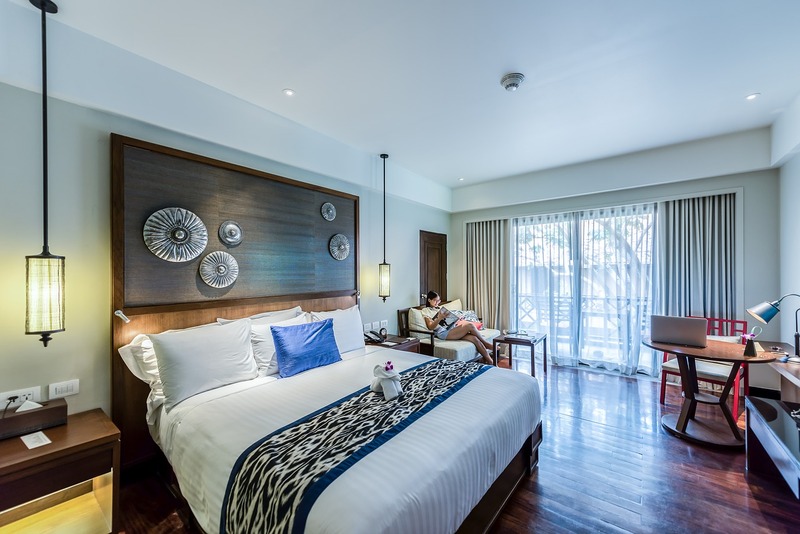 The rooms are great, with a modern design and high-end finishing, both for families and solo travellers. This hotel offers a great value, offering top notch accommodation for moderate prices. Also located in the city centre, Holiday Inn is a block away from the train station, and the free bus station is just across the street. In this area, you can find the best restaurants, bars and shopping corners in Perth. Among all the facilities, this hotel offers the Kids Stay & Eat Free program, restaurant, on-site parking, business centre, plus access to the fitness centre located nearby. Despite the central location, it’s quiet here, so you can get a good night’s sleep. The rooms are modern, well-equipped and spacious. Being situated in Northbridge, Attika Hotel has an ideal location to explore the vibrant city of Perth and its attractions. This is an apartment hotel that offers one-bedroom units and can fit up to four people. There is a kitchenette with all the necessary equipement, so grab some fresh local produce at the market and enjoy your dinner in a cosy atmosphere. Staying in Attika Hotel is a great idea for young couples or solo travellers, as you can find the best bars and dance clubs in the Northbridge area. To read about other mid-range hotels in Perth, check out this article – Best mid-range hotels in Perth. Billabong Backpackers Resort won many awards as the best hostel in Western Austalia, and that happened for a reason. It is not a regular hostel, Billabong Backpackers Resort offers an outdoor pool, beach volleyball court, library, cinema room and billiards table for guests’ entertainment. Every night, they organise dfferent events for people to mingle around and make friends. Great location, free parking, air-conditioning, private bathrooms, and even a balcony! Billabong Backpackers Resort is the perfect hostel for your stay. Kangaroo Inn is a hostel suitable not only for backpackers, but also for couples and young families who enjoy a community atmosphere and like to meet fellow travellers. The location is just amazing, less than a 5-minute walk will take you to the best places to eat, drink and shop. The entertainment facilities place this hostel among one of the best Perth accommodation options. You can choose from reading a book at the library, having a BBQ, watching TV with friends, enjoying a drink at the lounge area or on the terrace. Set in a gothic-style house, The Witch’s Hat is a special hostel due to its funky building architecture. There is quite a few freebies at this place, like free parking, WiFi, secure lockers, breakfasts, BBQ dinners and tea/coffee. The hostel is located a 5-minute walk away from Hyde Park Lake and Gardens. The heard of the entertainment and nightlife, Northbridge, is a 15-minute walk away. You get to choose from dormitory or private rooms with shared bathroom facilities. To read about other hostels in Perth, check out this article – Best hostels in Perth. Perth accommodation ranges from backpackers hostels to high-end boutique hotels, but there’s always that golden middle of reasonably priced hotels with fantastic facilities. Depending on your preferences, you get to choose from thousands of Perth accommodation options!